Disgruntled, aged dwarf that does not tolerate incompetence. The Underminer is a boss monster that bears a grudge towards all herodom due to an early traumatizing incident within its career involving a few pints too many of beer. Now living a honest life of work by mining and smithing, the only thing that can disgruntle the aged Underminer anymore is the sight of a hero doing what a hero does best - being idiotic. 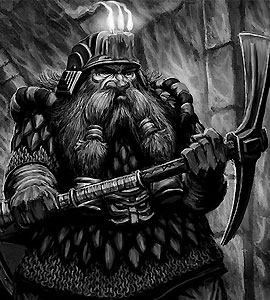 When he sees a groups of heroes, he will emerge from his tunnels beneath them and declare: "Behold, the Underminer! I'm always beneath you, but nothing is beneath me! I hereby declare war on peace and happiness! Soon, all will tremble before me!" Usually equipped with a self-made mithril pickaxe and several layers of boiled leather, the Underminer is bound to take a beating before it is defeated.